With alternative capital deployed across insurance and reinsurance markets having grown by 6% to $86 billion from the end of 2016 to the end of Q1 2017, it is clear that around the key reinsurance renewal period of January 1st it was collateralised reinsurance that was king, accounting for the lions share of the market’s growth. 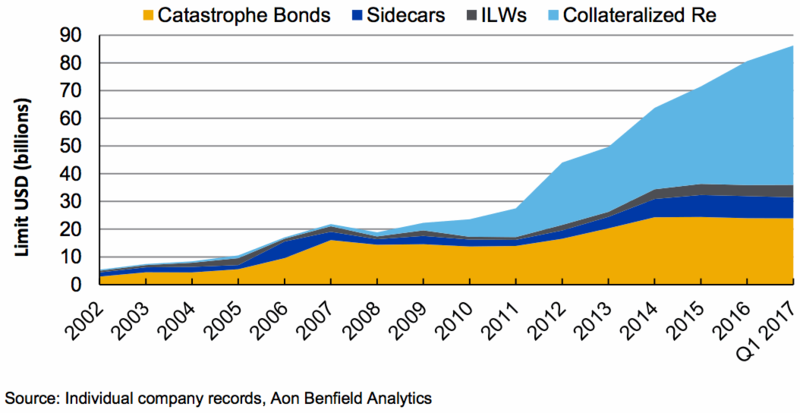 The latest data from reinsurance broker Aon Benfield shows that the collateralized reinsurance product continues to increase its share of alternative capital, while catastrophe bonds, sidecars and industry-loss warrants (ILW’s) share of the growing ILS market have remained relatively static. “The collateralized reinsurance product has again been the major beneficiary,” of this growth in alternative capital deployment, Aon Benfield explained in its latest reinsurance market report. This is despite the catastrophe bond market having witnessed a record quarter in Q1 2017, because, “The catastrophe bond sector has seen significant ‘churn’, with record first half issuance balancing numerous maturing transactions,” Aon Benfield said. Deployment of capacity into collateralized reinsurance sidecars remained relatively static, with a few launches but also a few downsizing as their sponsors shift focus to other strategies such as ILS funds, or a different type of collateralized vehicle. Industry-loss warranties (ILW’s) were also relatively static, with little growth seen in that side of the market despite the shifting of buying patterns. The collateralized reinsurance product remains the most comparable with traditional reinsurance, effectively being a fully-collateralized layer of a normal reinsurance program. Hence it’s the easiest to get completed, the simplest for a ceding company to understand and perhaps the most efficient in terms of price given the lower effort required to get deals done. For these reasons collateralised reinsurance is likely to outpace other ILS product options for some time to come, until levels of effort and understanding required to transact them are made simpler and more standardisation is achieved, in certain lines of business.